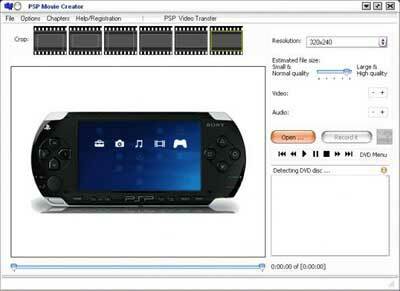 PSP Movie Creator converts DVD movies and various video formats to Sony’s PSP directly. Supported video formats include DVD, DivX/XviD video, avi, wmv, mpg, mpeg, dat(VCD), rm, rmvb, Tivo2Go, dvr-ms, qt, mov and more. DVD subtitles are also supported. This PSP Movie Creator is also a PSP video management software designed for dummies. It connects to the PSP and transfers video for you, automatically sets default PSP video filename, PSP video title, and captures video thumbnail even in the middle of previewing/recording by simply clicking the capture button. A built-in PSP video explorer window can list video filenames and PSP video titles side by side. • Convert DVD to PSP Video in One Click. • Convert DVD to PSP, Tivo to PSP, DivX/XviD to PSP movie, AVI to PSP movie, WMV to PSP movie, MPG/MPEG to PSP, dat(VCD) to PSP, rm/rmvb to PSP, VOB to PSP, dvr-ms to PSP, MOV to PSP movies. • Up to 4x faster than other Video/DVD to PSP conversion software. • Fully optimized for Dual Core, Hyper-Thread processor. • Optimized for SSE2/SSE/MMX/3DNow! and Graphics Card Acceleration. • Subtitle and audio language change through DVD menu. • Dolby, DTS Surround audio support. • Easy video crop and aspect ratio adjustment. • Easy video splitting, customizing video quality and size before conversion.